Grocery Lane: Thank You Very Much! As with anything, if you start doing something consistently, it will soon become a habit. Hopefully thank you note writing will become a habit for our kiddos. There's nothing like getting a note in the mail with a heartfelt letter of thanks. I used to roll my eyes every time my mom made me do it, but I will say I am so grateful that she did! We didn't have a birthday party for Everett this year, but he did receive quite a few adorable gifts. 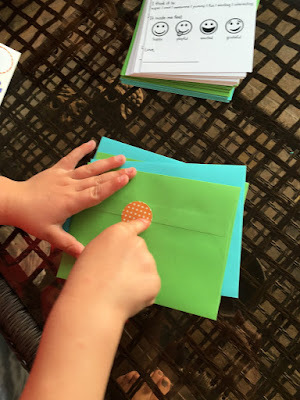 Since he can't really write yet, I wanted to find a way to let him help with his thank you notes. 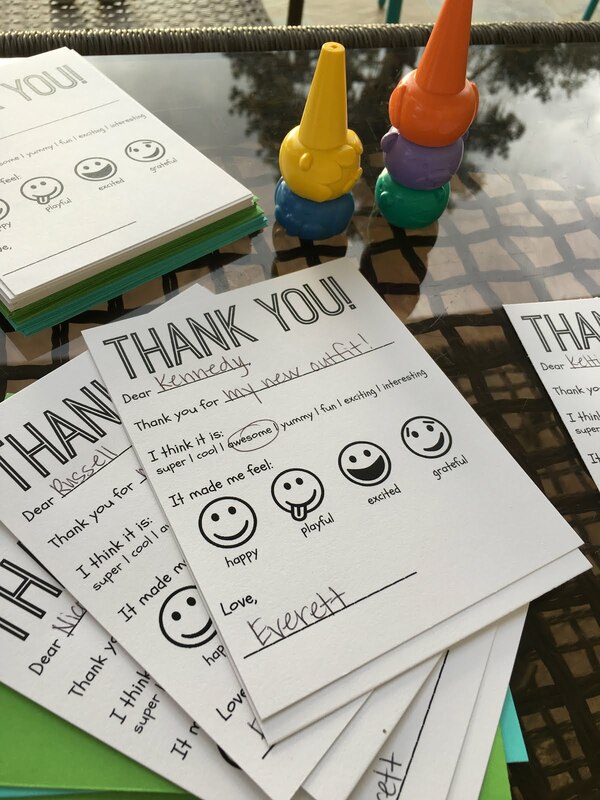 My goddaughter, Keltin, used to send the cutest fill in the blank thank you notes and I knew that I wanted to do the same with Everett as he got older. After searching a few stores, with no luck, for pre-printed kids thank you notes I knew I would have to turn to the internet. Well, let me tell you friends, I found it...FOR FREE! To make my thank you notes I simply right clicked, saved the picture to my desktop and then printed as many as I needed on white card stock. I printed them as 4x6s and cut them to size once they were printed, however you could chose the 5x7 option. Just make sure they fit inside the envelopes you choose! First I Googled "fill in the blank thank you notes for kids" to see what would show up online. There were tons of sites, all of which had thank you notes for sale. Not cheap I might add. Since pinching every penny is our goal these days (eh hem, two kids in daycare is tough! ), I simply went onto Pinterest next and searched the same query. I think I might have even added the word "printable" in front of the other words and a ton of pins showed up. I was stoked. 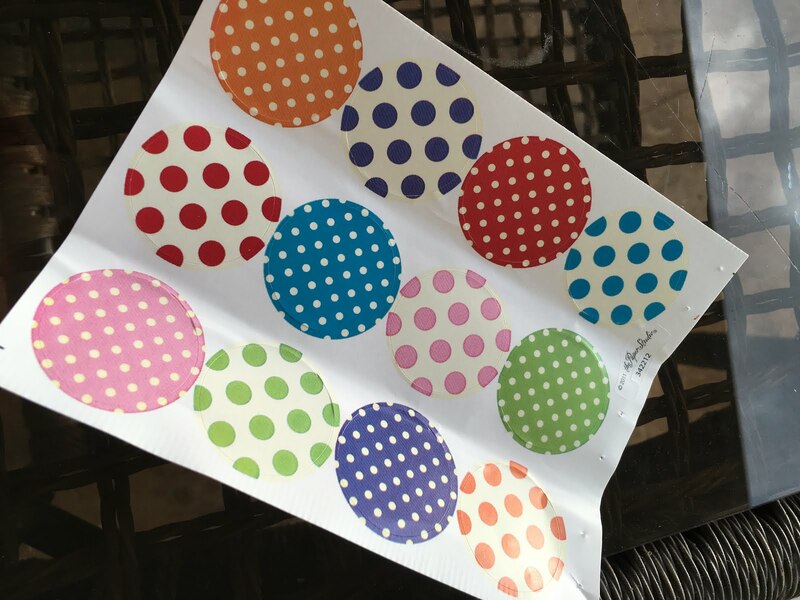 I knew I could buy blank, colored envelopes at craft stores (I found mine at Hobby Lobby), so I just needed the template to print on card stock. I could have made my own template, but along with saving money, saving time is also on the forefront of our lives these days. So making my own was not an option. 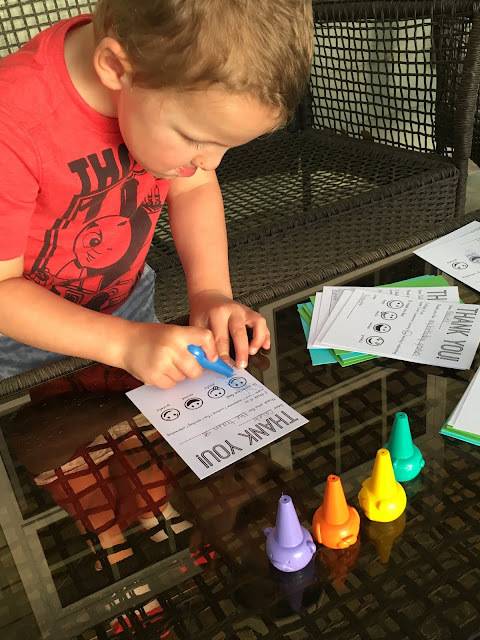 There was a plethora of templates to choose from, some with more writing opportunities, some with less, I chose the one that had a spot for Everett to color in the emotion he felt when he received the gift. As he gets older he will fill in his name, the gift and eventually the name of the recipient. This thank you card (shown above) I found over at Trust Me, I'm a Mom (via Pinterest) was my favorite, and will definitely grow with him, and Hilty, too! The mouth! It's always in crazy positions when he is concentrating! I also picked up these adorable envelope seals (Hobby Lobby as well) to engage him even more. 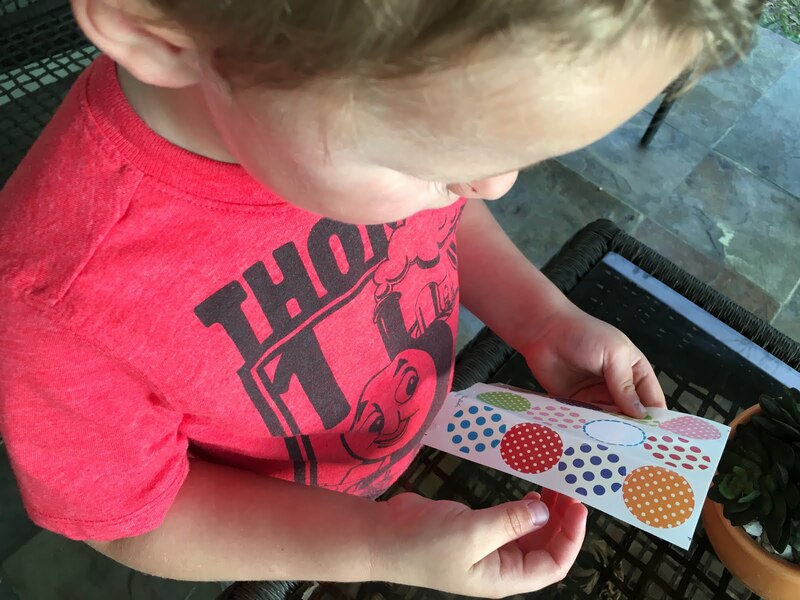 I mean, c'mon, what toddler doesn't love stickers; not to mention that it made the notes even cuter! 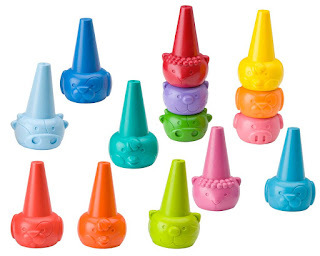 *I also found these Alex Toys Little Hands Farm Finger Crayons at US Toy on sale and E loves them. They stack, have cute farm faces on them, include lots of colors and help with fine motor skills/correct finger placement.